Here stb_image.h is used to load the image before it is blurred. iir_gauss_blur.h compiles as C and C++ so you can just plug it in and use it (tested it on GCC only though). The function is an implementation of the paper "Recursive implementation of the Gaussian filter" by Ian T. Young and Lucas J. van Vliet. It has nothing to do with recursive function calls, instead it's a special way to construct a filter. Other (convolution based) gauss filters apply a kernel for each pixel and the kernel grows as the blur strength (sigma) gets larger. Meaning their performance degrades the more blurry you want your image to be. Instead the algorithm in the paper sweeps across the image four times: From left to right, right to left, top to bottom and bottom to top. 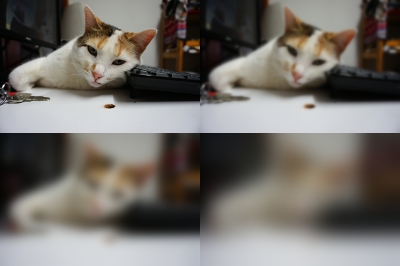 This is enough to propagate the blur across the entire image, no matter how large or small the blur strength (sigma) is. Thanks to that the performance always stays the same. You can have some ridiculously large sigmas without any performance hit. The same image blurred with different sigmas. The original (top left), sigma 1.0 (top right), sigma 5.0 (bottom left) and sigma 10.0 (bottom right). It seems the usual approach is to start out with some sigma value and then adjust it until you get the blurriness you want. There's also the concept of a "blur radius" but I have no idea what exactly it's supposed to mean. I suspect it's the kernel size for convolution based algorithms. There seem to be several rules of thumb out there, e.g. radius = 2 * sigma. 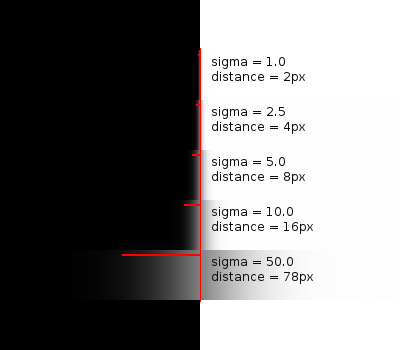 So if you want to have a blur radius of 10px you can use sigma = (1.0 / 2.0) * radius to get the sigma for it (5.0). I also found other interesting equations here and here (again for kernel sizes I guess). How far a pixel is blurred visually. That's the distance from the pixel where it can still leave a visible impact (cause a visible change). For "visible change" I used the somewhat arbitrary limit of a change of 16 in the brightness of a pixel (0 to 255). I used that since that's the smallest change from black I could make out on my display. How far we have to be away from a pixel until it can't change the color values at all. That's the distance at which it's impact isn't strong enough to change an 8 bit pixel value (0 to 255) by even 1. It's useful for me since that's the distance I need when creating padding around an image so I can be sure that the border of the blurred image stays black. A white bar (top and bottom) blurred with different sigmas. The red bars show the distance from the original white bar until the brightness drops below 16. It seems to work more or less well for a sigma up to 100. At least that's good enough for my use cases. But given how crude these approximations are take them with a grain of salt. Or even better a whole tee spoon of salt. They work for me but might not work for anything you have in mind. That's why I decided to leave these calculations out of the iir_gauss_blur() function. Just in case they work for you and you also want to use them via the command line I created a corresponding CLI tool. By the way: The algorithm looks like it could be implemented quite nicely on a GPU with OpenCL or compute shaders. I assume for small sigmas a convolution based GLSL implementation is probably faster. It can use the bilinear interpolation of the hardware and is probably more local and texture cache friendly. But for larger sigmas the "recursive" algorithm will outperform it, even if it needs 4 passes over the data. Also its performance doesn't degrade with the blur strength so that might be the killer argument in some cases. Anyway, I'm very happy with the (single-threadded) CPU performance so I won't do that any time soon. Having thoughts on your mind about this stuff here? Want to tell me and the rest of the world your opinion? Write and post it right here. Be sure to check out the format help (focus the large text field) and give the preview button a try. Please us the following stuff to spice up your comment. Please add 5 and 3 Just to keep your skill sharp and my comments clean. Design, code and content from Arkanis Development, header image from twisesq (Some rights reserved). Uses the Silk icon set.